What is the Brown Scapular Promise? What are the requirements for gaining the Brown Scapular Promise? How am I enrolled in the Brown Scapular? What is the formula for investiture? What is the Confraternity of the Brown Scapular? How do I wear the Brown Scapular? What should the Scapular look like and be made of? May I wear a Scapular medal instead? Must I always wear the Scapular? If I get a new Scapular, do I need to be re-invested? What are the indulgences granted to those who wear the Scapular? What is the Sabbatine Privilege? What are the requirements for gaining the Sabbatine Privilege? 1.What is Our Lady’s promise in wearing the Brown Scapular? 2.What are the conditions requisite for gaining the Our Lady’s promise of the Brown Scapular? 1.To observe exactly what has been prescribed regarding material, color, and shape of the Scapular. 2.To be enrolled in the Scapular by a priest. Please note that there are no special prayers or good works that are necessary to receive the promise. The Scapular is a silent prayer that shows one’s complete consecration and dedication to the Blessed Virgin Mary. The Scapular is a devotion whereby we venerate Her, love Her, and trust in Her protection, and we tell Her these things every moment of the day by simply wearing the Brown Scapular. 3. Who may be invested in the Brown Scapular? All the Catholic faithful should be enrolled. It is customary for children to be enrolled after their First Holy Communion. Even infants can be invested. 4. How do I enroll in the Brown Scapular? 5. Who can enroll me in the Brown Scapular? Any Catholic priest can enroll you. It was once customary that only the Carmelite Fathers were permitted to enroll the lay faithful, and special permission was needed for any other priest to perform the ceremony. However, this devotion has spread so far and wide throughout the Catholic world that now the Church has given permission to all priests to invest the faithful in the Brown Scapular. 6. Is there a special formula for investiture? Yes. If you would like a copy of the investiture ceremony in either Latin or English, please click here. 7. What is the Confraternity of the Brown Scapular? Once invested in the Scapular, a person automatically becomes a member of the Confraternity of the Brown Scapular. What is meant by the Confraternity is that, having been enrolled in the Scapular, you belong to a spiritual family whereby you have the privilege of being affiliated with the Carmelite Order, participating in the merits of the Carmelite Fathers and Religious in life and in death, as well as receiving the promises of Our Lady through the Scapular. Although at one time it was customary to inscribe one's name in the Confraternity Register (the parish priest would do this for all those he enrolled by sending the names to a Carmelite convent where the Confraternity was canonically erected), it is no longer the practice to do so. Part of the reason for this is that the Scapular has become, thanks be to God, such a universal sacramental and devotion that the Church has taken away this obligation upon the lay faithful. It is sufficient to be invested in the Scapular to be a member of the Confraternity. 8. How do I enroll in the Confraternity? By being invested in the Brown Scapular by a priest. 9. Can an ordained deacon enroll a person in the Brown Scapular? No, an ordained deacon cannot enroll a person in the Scapular. Only an ordained priest of the Catholic Church can perform the investiture. 10. How must I wear the Scapular in order to receive its benefits? You must wear it over the shoulder so that one part hangs over your chest and the other side hangs over the back. Both parts cannot be carried in the front or the back, otherwise, the wearer runs the risk of not receiving the promise. 11. May the Scapular be fastened or pinned to my clothing? No. It must hang over the shoulders with one side hanging in the front and the other side hanging in the back. 12. 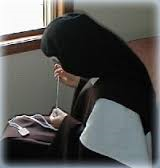 Does the Scapular have to be 100% wool? Yes. Cotton, silk, and any other material is strictly forbidden. 13. May I use a chain instead of a cord for my Scapular? Yes, just as long as the scapular itself is 100% wool. 14. What shape does the Scapular have to be? It must be oblong or square. It cannot be oval, round, or polygonal. 15. May the Scapular have any other images on it? It is permitted to ornament the Scapular with images or pictures, such as Our Lady of Mt. Carmel or the Carmelite shield. However, the wool brown color of the Scapular must predominate. 16. Does the Scapular have to be touching the skin? No, it may be worn over or under any part of the clothing. 17. May one wear a different color of the Scapular? Different color Scapulars do exist as sacramentals in the Church for other devotions, such as the Red Scapular in honor of Our Lord’s Passion. However, the Brown Scapular that the lay faithful wear is a miniature of the Carmelite Religious Habit, and since that Habit is brown in color, it has always been regarded as the proper color for the Scapular. However, black wool is permissible. 18. Must I always wear the Scapular or may I take it off? In order to receive the promise, the Scapular must always be worn. We must understand that by wearing the Scapular we show our consecration and devotion to the Blessed Virgin. Our Blessed Mother cannot be pleased in any one who out of vanity or fear takes it off whenever it is not convenient to wear it. By wearing it we make an open profession of our faith, confidence, and love of Her. 19. May I take my Scapular off to bathe? 20. May I wear a Scapular Medal as a replacement for my Scapular? No. However, our modern Popes, notable St. Pius X and subsequent Popes, have declared that in necessary cases such as in foreign or tropical climate missions, the Scapular Medal may be worn instead of the wool Scapular. But if the Scapular Medal is worn for insufficient reason, such as vanity or convenience, the wearer runs the risk of not receiving the benefit of the Scapular promise. It is important to remember that the small Scapular worn by the lay faithful is meant to be a miniature version of what the Carmelites wear as part of their Religious Habit, which is never substituted for anything else. 21. If I need a new Scapular, do I need to be re-invested? No. If your Scapular has worn out or has broken, you only need to get another one and put it on. The blessing and investiture is still valid for the new Scapular, since the blessing is predominately given to the person who is invested in the Scapular. 22. What are the indulgences granted to those who devoutly wear the Scapular? 1.A plenary indulgence on the day of receiving the Scapular. Conditions: Confession and Communion. 2.Plenary indulgence at the moment of death. Conditions: Confession, Communion, and devout invocation with the lips, or at least with the heart, of the Holy Name of Jesus. 3.Reciting the Office of the Blessed Virgin Mary devoutly – 100 days indulgence. 4.Each time the Scapular is kissed – 500 days indulgence. 23. What is the Sabbatine Privilege? It is the promise piously to be believed, that the Blessed Virgin Mary gave to Pope John XXII in a vision, that She will deliver Her faithful children who have worn the Scapular devoutly from purgatory soon after their death, notably the first Saturday after death. “As a tender Mother, I will descend into purgatory on the Saturday after their death, and will deliver them into the heavenly mansions of life everlasting.” (Words of the Blessed Virgin Mary to Pope John XXII). This Sabbatine Privilege was promulgated and taught through the famous Bull Sacratissimo Uti Culmine (Sabbatine Bull) of Pope John XXII in 1322 and given definitive ratification in 1908 by the Holy See. 24. What are the requirements for obtaining the Sabbatine Privilege? 1.To wear the Brown Scapular continuously. 2.To observe chastity according to one’s state in life. 3.The daily recitation of the Little Office of the Blessed Virgin Mary OR to abstain from meat on Wednesdays and Saturdays OR with the permission of a priest say 5 decades of the Holy Rosary. Carmelite Devotions compiled by a Carmelite Tertiary, 1956.